It’s a big, wide world. If you have little ones at home, you might recognize PEEP from Ready Set Learn! on TLC and the Discovery Kids Channel. But it’s a big, wide world for adults too, especially if you are a quilter! No longer are quilters just sitting in home or in church basements quilting with friends. They are flying around the world – and visiting other quilters from all walks of life. They are attending quilt shows, gallery exhibitions, and art exhibits. They are meeting with fabric companies to design their own line, with photographers to capture their work, and with publishers to get it into print. Yes, quilting is not the same as it used to be. If you’re a blogger, you probably have quilt friends you haven’t ever seen face to face. Yet, you keep in touch with them and have formed a friendship based on your love of quilting. You share your joys, concerns, ask for help when you need it, and celebrate with each other over big and small accomplishments. It’s marvelous to have great quilting friends – even from afar. Here are few of my quilting friends (from near and afar). Visit their site and tell them you stopped by. Tell them Caron sent you! NOTE: photos are from each friend’s website, which I hope you will visit by clicking on their names. Wendy Sheppard – I found Wendy’s work online and was instantly in love with her meticulous quilting and sense of design. And what a sweet person! Wendy is a writer, and you may read one of her articles in the July/August 2008 issue of Creative Machine Embroidery Magazine. Ami Simms -You can’t be a quilter if you haven’t heard the name Ami Simms. But did you know she has a blog? 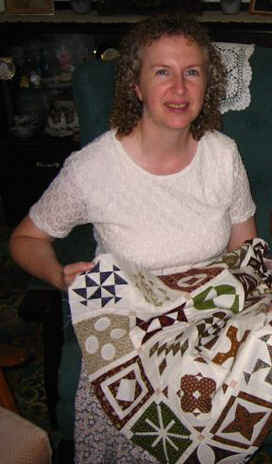 Ami is a fantastic quilter and teacher, and no doubt you have had an opportunity to take one of her many classes. She was named Teacher of the Year by Professional Quilter Magazine in 2005. Ami is also the Founder & Executive Director of the Alzheimer’s Art Quilt Initiative. Ami and I are old quilting buddies from the early 80’s (old as in we go way back, not as in age), but she’s done far more in her lifetime than I will ever hope to accomplish. Check out her blog! Rosa Robichaud is a fellow Dear Jane friend, and I sincerely wish she lived next door to me. Her humor and personality and willingness to help anyone is to be commended. Rosa is collecting 30’s fabric, lives in Canada with hubby Gilbert, and is also into GeoCaching. Elly Dunbar – Elly lives “just across the pond” in Caithness, United Kingdom. She’s another quilter I met through working on my Dear Jane quilt. Elly has been quilting a little over 10 years now, but you’d never know it from looking at her beautiful work. Elly and I are the same age, both have two kids, and have a lot of in common. I’ve always wanted to go to the UK, so one of these days I might just knock on her door. Hey Elly! 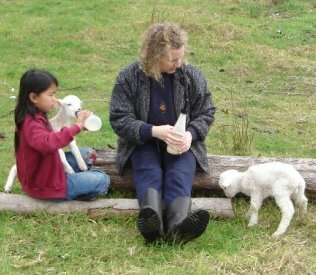 “In response to The Great Commission, Compassion is an international Christian child development ministry, committed to child advocacy and working in partnership with local churches around the world to foster the spiritual, economic, social, physical and emotional development of children living in extreme poverty in over 25 developing countries. Compassion’s ministry to children is distinctly Christian.” Please visit the Compassion website and consider sponsoring a child. 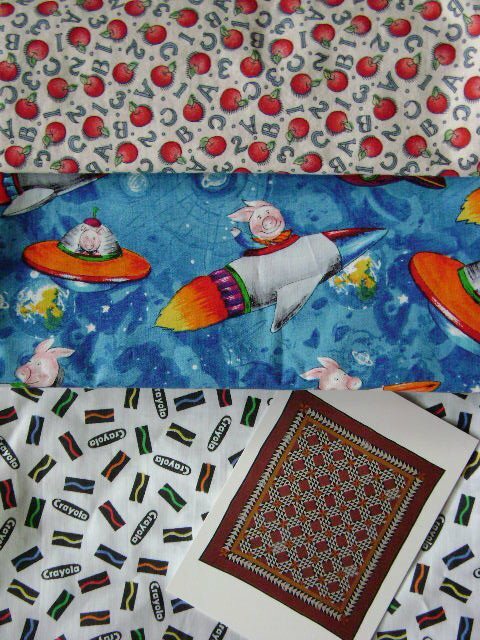 In thanks for all my quilting friends and in honor of children and quilting, I’m giving away three kid-friendly fabrics and 1 dozen quilt postcards. If you want to participate, leave your name in the comments and let me know you were here. Stormie will help me pick a winner from the entries on June 21st. Tell your friends! You have a lovely site, Caron! You’re more than welcome to visit mine any time you wish. (You should be able to link it from my comment.) I have no pictures, no music, no fancy stuff, and I’m all over the place in re subject matter. I live in Houston, TX (and, by the way, we have a pretty good-sized quilt show every fall at the George R. Brown Convention Center here), and would like to be entered in your give away. Please enter me — great fabrics, but I’m charmed by the postcards. I write my Mom in Louisiana weekly and she’d love the letters….have a great weekend. Hi Caron,What an HONOR to be recognized as one of your quilting friends!!! Thank YOU for being my quilting friend. I always enjoy seeing you work, and am appreciative of you sharing them with us.Blessings! I’ve been lurking here for awhile, love your Dear Jane! I’m going to go visit your friends next! I’d love to be in your giveaway. I am thankful to you for sharing these great quilting personality with creative embroidery designs. I am new in this field and improving my skills in embroidery designing.